Lopez, W. D., Novak, N. L., Harner, M., Martinez, R., & Seng, J. S. (2018). The traumatogenic potential of law enforcement home raids: an exploratory report.Traumatology. https://doi.org/10.1037/trm0000148. Posttraumatic stress disorder (PTSD) is a highly researched area when considering its relevance to the police officer function. However, little effort has been paid to the development of traumatic stress for eyewitnesses of police raids. The use of military equipment and aggressive tactics employed by police in the execution of search and arrest warrants can be disturbing to children and family members of the criminal target. Lopez, Novak, Harner, Martinez, and Seng (2018) conducted interviews of four individuals who were involved in a 2013 raid conducted by a Special Weapons and Tactics Unit and Immigration and Customs Enforcement agents. The authors used a content analysis design in order to apply PTSD diagnostic criteria of the DSM-5 to the interviews. Findings suggested that those who were present during the raid met criteria for PTSD or complex PTSD symptoms which include suicidality and nightmares. This article highlights the need for more research in the etiology and prevention of PTSD for eyewitnesses of dynamic police operations. Silver, J., Fisher, W., & Horgan, J. (2018). Public mass murderers and federal mental health background checks. Law & Policy , 40 (2), 133–147. Public mass shootings have become an unfortunate reality in American society, phenomena that remain largely misunderstood by both scientists and police practitioners. In response to this, there has been much debate concerning the implementation of measures to reduce the incidence in which mass shootings occur. One such measure is examining mental illness as a predictor of future violence. While most jurisdictions have statutes which prohibit gun licenses for those with certain psychopathology, empirical data appear to illustrate that those who suffer from serious mental illness are no more prone to commit gun violence than their normal functioning counterparts. Notwithstanding this, Second Amendment provisions restrict the government from interfering with many who would limit gun ownership. Silver, Fisher, and Horgan (2018) examined whether increasing the number of gun-disqualifying mental health records in the National Instant Criminal Background Check System would inhibit the ability of someone with a serious mental illness from purchasing a gun. The researchers used a sample of 106 offenders who used a firearm to commit a public mass murder in the USA from 1990 to 2014. It was of interest to the researchers to assess whether these offenders would have been prohibited to purchase a firearm after a federally mandated mental health background check. Results indicated that 50.9% (n = 54) of the sample had prevalence of some mental illness or mental disorder. This article expands the discussion on mental health and mass murder, and their application to gun ownership. Higham, P. A., Roberts, W. T., & Detachment, R. C. M. P. (2018). Analyzing states of consciousness during retrieval as a way to improve the cognitive interview Commentary on Memon & Stevenage on. Psycoloquy , 21J29. The cognitive interview is a widely accepted method for obtaining eyewitness memory of crime events. This interviewing strategy is credited with revolutionizing how police obtain important, corroborative information from eyewitnesses and victims. Higham and Roberts (2018) critically evaluated Memon & Stevenage’s (1996) analysis of the cognitive interview, which originally suggested that this interview methodology was prone to contain errors and produce confabulations. The article provides that there has been a paradigm shift in the manner that police obtain information from eyewitnesses. For example, the authors indicate that in the early years, police conducted “interrogation-style” interviews which consisted of frequent interruptions and closed-ended questions. Further, it is thought that demand characteristics are seen as a factor which seems to encourage the witness to produce an expected outcome for the interviewer. The authors attempt to outline a possible technique to minimize mistakes and enhance the efficacy of the cognitive interview. Witnesses are encouraged to indicate whether they remember (consciously recollect) or know (believe, but do not recollect) that a detail actually occurred. This element has origins from Tulving’s (1985) remember/know paradigm, which was deeply rooted in recognition tasks. It is hypothesized that the more contextual information provided by the witness, the greater chance for accurate reporting of events. Considerations are made for the utility of the remember/know feature in hypnotic interview. Solomon, N. (2018). Redefining the psychological autopsy: a proposal for collaboration between forensic pathology and investigative psychology. Journal of investigative psychology and offender profiling , 15 (1), 46–50. The emerging field of investigative psychology employs statistical methodologies such as small space analysis and behavioral linkage analysis in order to establish offender profiles and enhance findings relative to crime scene investigations. In contrast, forensic pathologists are oftentimes utilized to assess clues by conducting a postmortem of the victim. There appears to be disparity when considering the inherent value of evidence presented by investigative psychologists. 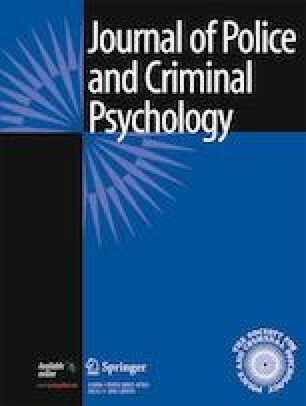 Solomon (2018) notes that while these separate disciplines may each contribute to relevant criminal investigation outcomes, there could be appeal in incorporating forensic psychological findings into investigative psychology research, and applying investigative psychology to forensic pathology practice. A major theme found throughout the article is highlighting the need for collaboration between forensic pathologists and investigative psychologists. For example, Solomon illustrated the potential usefulness in developing a database which documents pathological findings so as to enhance datasets for empirical profilers. A second, less emphasized premise of the article was a discussion on the historical admissibility of testimony related to forensic pathology versus investigative psychology in court settings. While medical pathology is rarely contested, more work must be done to establish the admissibility of evidence with regard to empirical profiling conducted by investigative psychology professionals.